One of the great things about living in a city like Manchester is that there’s always something to keep you entertained; whether that’s a new performance at the theatre, an exhibition at one of the galleries or an outdoor market to browse. And when an event that involves food comes to town, all the better! 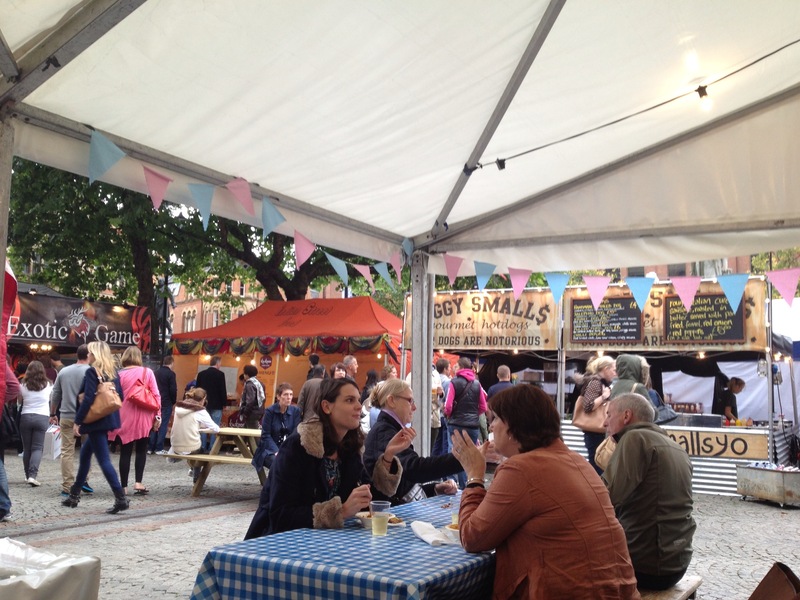 This weekend I headed to Albert Square to check out Manchester Food & Drink Festival 2013. With the beautiful Victorian backdrop of the Town Hall to set the scene, a live band playing in the marquee and the sun (surprisingly) shining, I set about exploring all of the stalls on offer. Many of them had tempting displays of groceries to take home, including middle-eastern ingredients, vibrant macaroons and continental delicacies. But it was soon midday and I’m a greedy sister, so it wasn’t long before I found myself in front of the street food stands debating what on earth to buy for lunch. 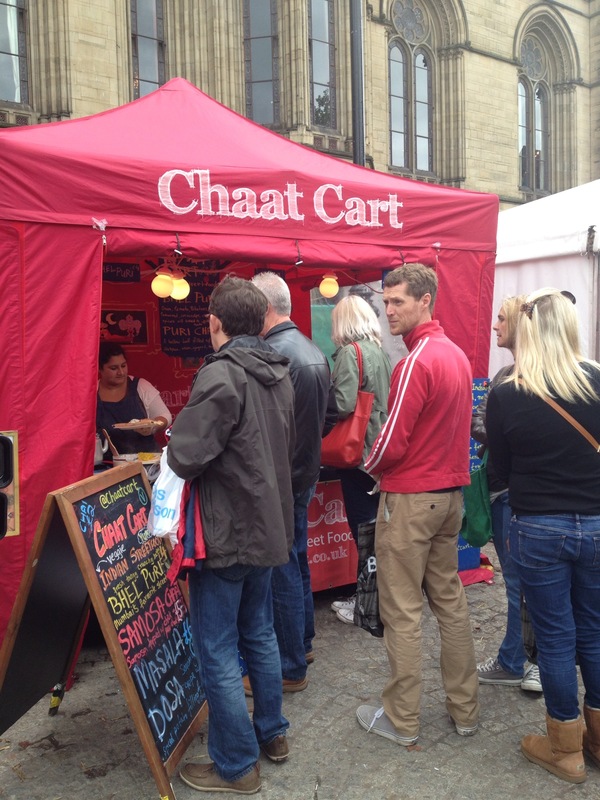 After a good ten minutes spent snooping on what everybody else was snapping up, I decided the Indian Chaat Cart was the one for me. The queue was huge at this popular venue so I had plenty of time to decide on a dish, and after what seemed like the millionth ‘masala dosa’ passed my hungry self, my mind was made up. A dosa is a savoury Indian pancake made from rice batter and lentils, popular in the south of the country. It’s filled with vegetables and served with either a dip or chutney. 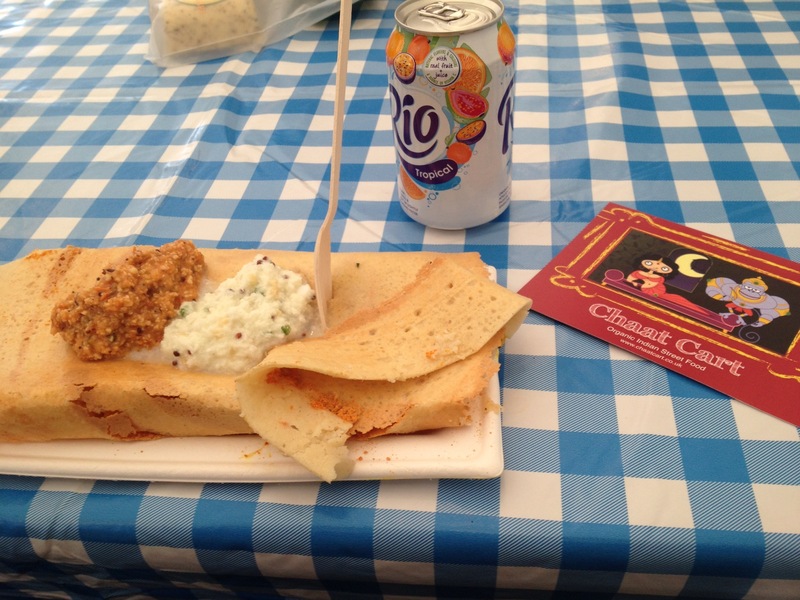 The crisp Chaat Cart dosas were stuffed with a delicious spiced potato filling before being rolled up and topped with a cool coconut dip and tangy chutney; delicious! I also picked up a recipe card from the Chaat Cart for a tempting Bhel Puri that I’m definitely going to be trying in the future. 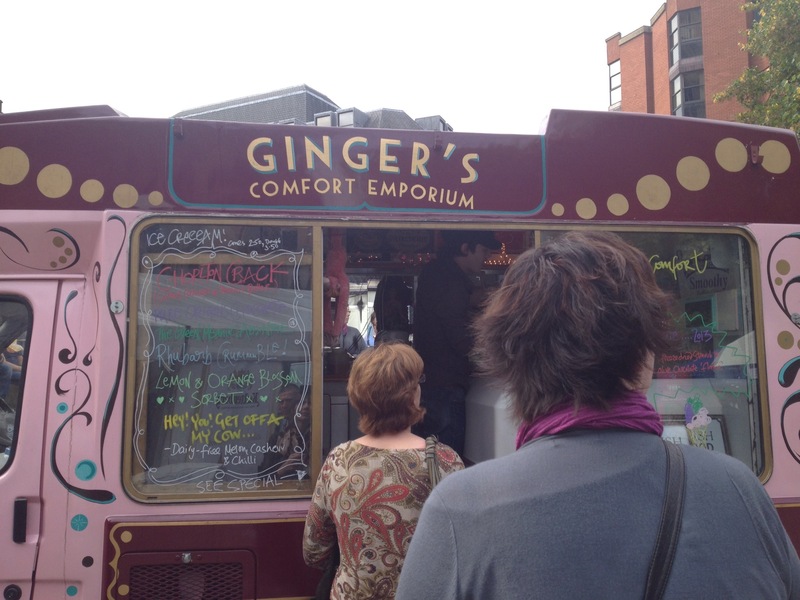 While people watching and finishing the last of my dosa, I spotted the unmistakable ice cream van, Ginger’s Comfort Emporium, which is renowned in Didsbury and Chorlton for selling the tastiest ice cream in the city. Given that I was at a food festival and the sun was out for once, I had to make the most of the opportunity. The only difficult choice was deciding on a flavour. I was sorely tempted to go for the olive oil option, after my greedy sister raved about a similar dessert during a recent trip to Croatia. But, staying loyal to my home, I went for ‘Chorlton crack’, a glorious blend of salted caramel and peanut butter. The portion was hearty but I finished every last morsel; even the cone (often annoyingly dull and dry) was completely addictive. The whole point of food festivals is to try something new whilst supporting local businesses and I’d really recommend hunting down a similar event somewhere near you. Next up for Manchester’s Albert Square is the Christmas Markets (opening on 15th November), bring on the mulled wine, crepes and tartiflette!